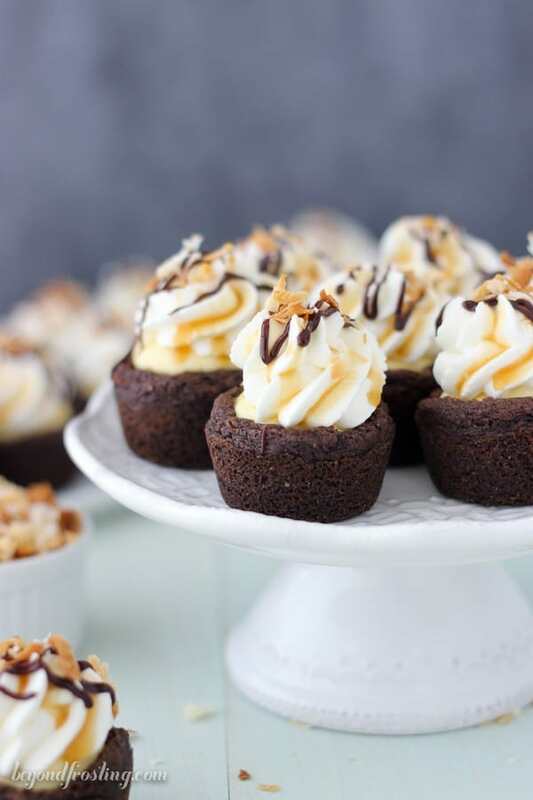 These Samoa Cream Pie Cookie Cups are a chocolate pudding cookie filled with a vanilla-caramel mousse and topped with whipped cream, toasted coconut and plenty of chocolate sauce and caramel. These are the next best thing besides samoa cookies. 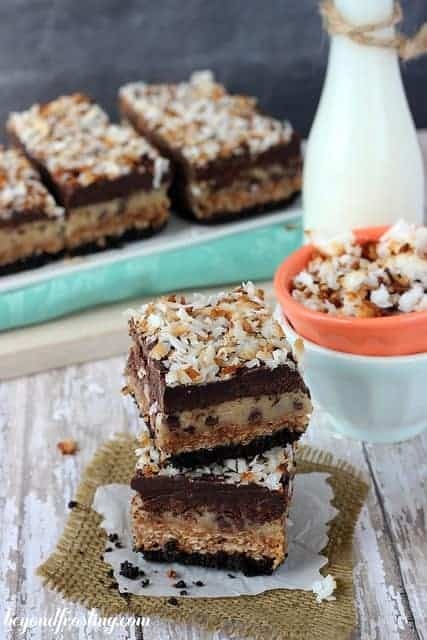 Surely I have waited long enough to share another samoa recipes with you right? 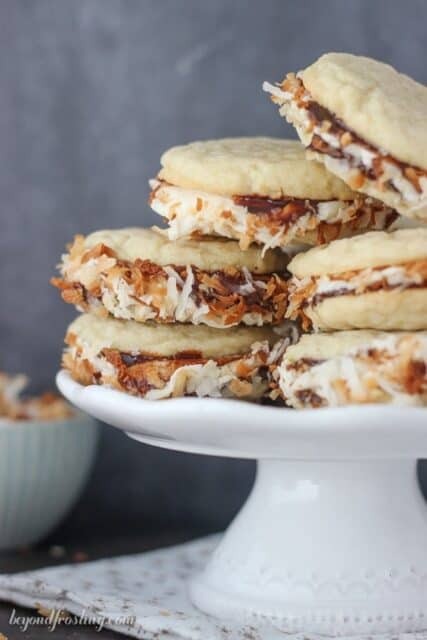 I know I just shared my Samoa Sandwich Cookies last week, but I just couldn’t wait any longer. Before I jet off into mountains for the next few days, I needed to be sure I left you with your samoa fix. 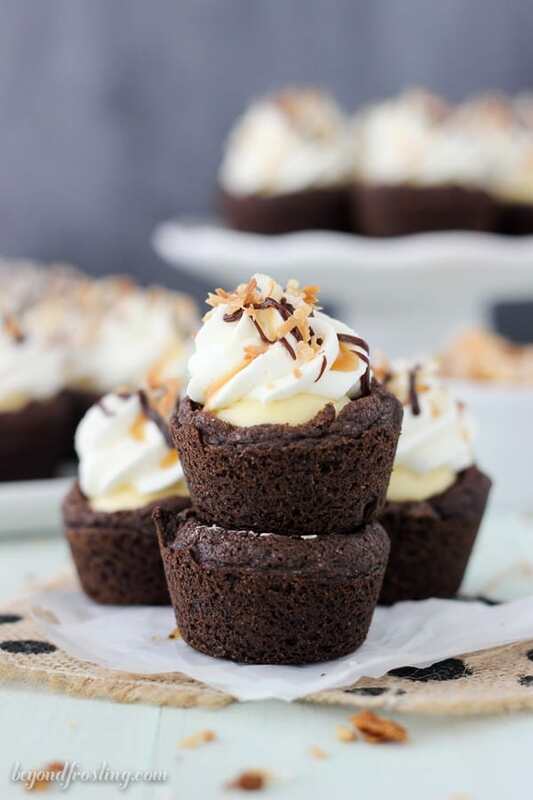 After all of the cookie cups I’ve made, it’s very hard to pick my favorite, but I am pretty partial to caramel, chocolate and toasted coconut. Actually when I showed up to Lindsay’s house this past weekend, she had 5 boxes of Girl Scout Cookies sitting on her counter and it was all I could do to prevent myself from tearing right into them. 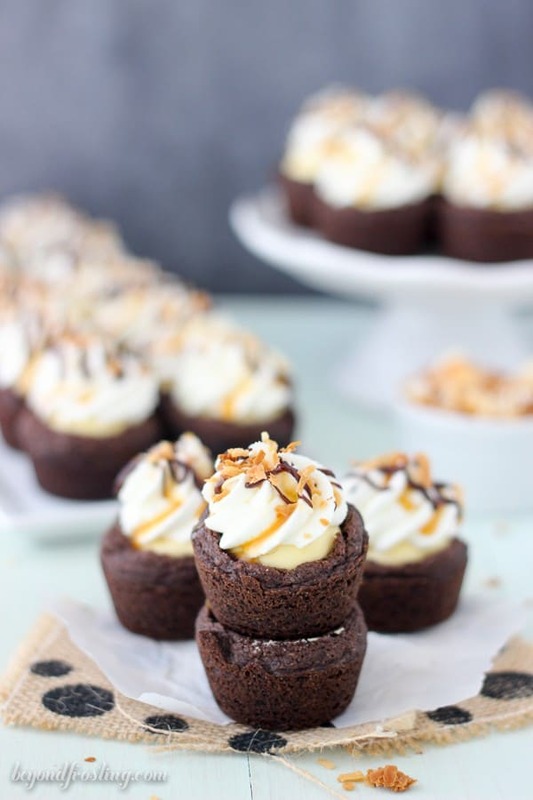 These Samoa Cream Pie Cookie Cups start with a dark chocolate pudding cookie. I’m addicted to Hershey’s Special Dark pudding mix, which I use in the cookie dough to help keep these cookies extra chewy after I take them out of the oven. I own a mini muffin pan that is deeper than most, but that is why I absolutely love it. It’s a little bit straighter on the sides, which help form a large cookie cup. I own the Calphalon Mini Muffin Pan , but if you use a standard size mini muffin pan, that’s totally fine. You may end up with a few more cookies that are a little bit smaller than mine. That just means there is more to go around. For the filling, I have chosen to go with a vanilla mousse that is sweetened with a little bit of caramel. I actually considered a coconut mousse instead, but opted for vanilla so that the toasted coconut garnish would stand out. 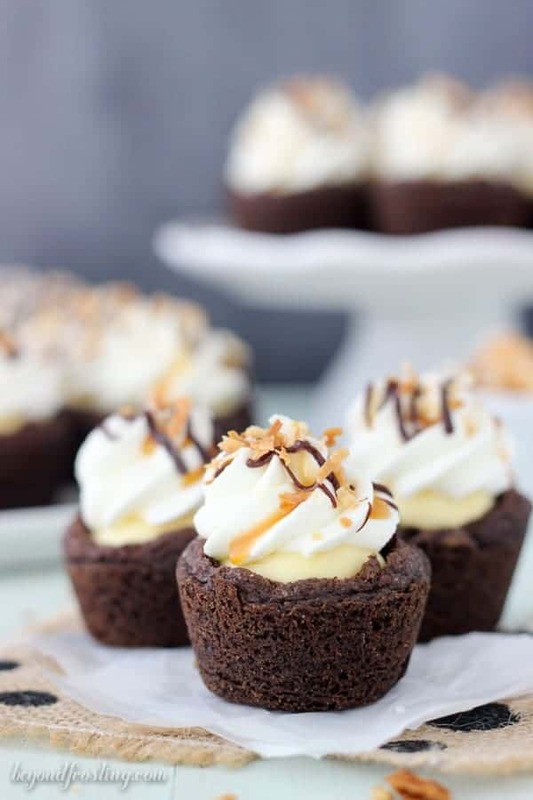 Once you add the filling, these cookie cups will need to be refrigerated for at least an hour to allow the mousse to set and form those little air pockets that help keep it extra light in texture. You might have some leftover filling. I have to throw it out, otherwise I will eat it all. I am sure you will be able to put it to good use. 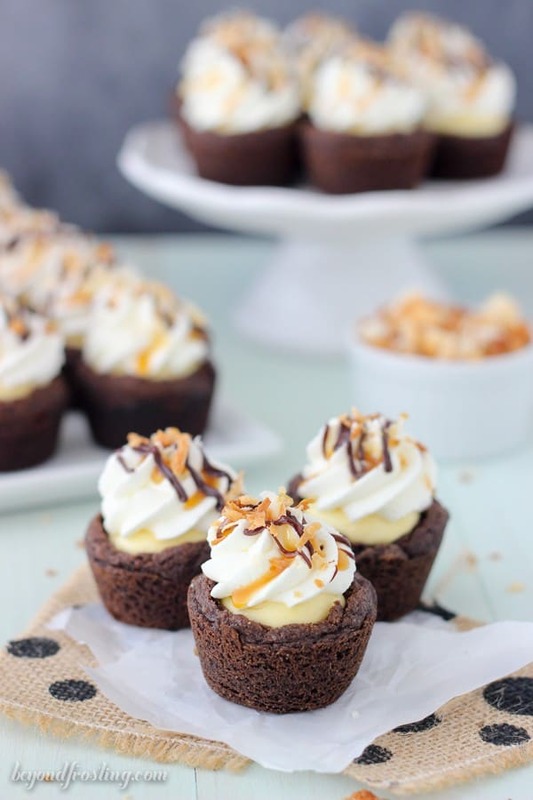 These cookie cups are topped with a homemade whipped cream. If you aren’t comfortable with whipped cream, then you can substitute Cool Whip, but I really hope you will try it with the whipped cream first. I know that whipped cream can be daunting, but it really is much more simple than you would think. There are a few simple tips that can help you to be successful. I have a stand mixer with a metal bowl. I put my bowl and my whisk in the freezer for a good 10 minutes so that it gets nice and cold. This helps keep the cream cold while it’s whipping. I use a combination of heavy whipping cream and powdered sugar to help stabilize the whipped cream. I use 50% powdered sugar. For instance, this recipe calls for 1 ½ cups heavy whipping cream and I use ¾ cup powdered sugar. This makes a nice stiff whipped cream which is perfect for piping. I added the whipped cream topping to these cookies as soon as I was done adding the filling, then I can just toss them in the fridge. To finished these off, I used plenty of toasted coconut, caramel and hot fudge sauce. Don’t be shy with those toppings either! To toast the coconut, I do it at the same time as the cookie cups and just keep and eye on it. It won’t toast as quickly because your oven is only at 350° F instead of 400°F or warmer. It’s much easier than waiting! So while I am heading to enjoy some snow, I hope that you all will get in the kitchen and whip up a batch of these cookies. Especially if you run out of the Girl Scout cookies. 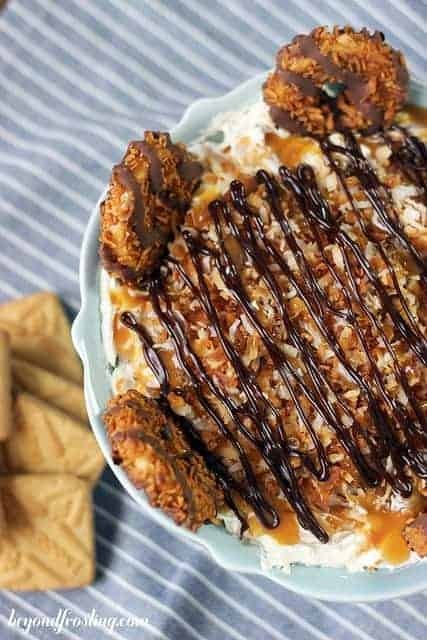 I’ve got plenty of more samoa recipes for you to check out below. Preheat oven to 350° F. Grease a mini muffin pan with cookie spray or Crisco. Combine butter and sugars in your stand mixer and beat on medium speed until light and fluffy. Add the eggs and the vanilla extract. Beat these into butter and sugar until thoroughly mixed. In a medium-sized bowl, combine the flour, cocoa powder, dry pudding mix, baking soda and salt. Stir to combine and then set aside. Slowly add the dry ingredients into batter and beat on a low speed until the dough starts to form. If the dough is a little dry, add 1 tablespoon of milk. Set dough aside. Drop 1-1.5 tablespoons of dough into the greased mini muffin pan. Bake at 350°F for 12-15 minutes. Remove the cookies from oven and allow to cool for at least 5 minutes. Use a tart shaper or the back of a spoon to gently push down the middle of the cookies. Allow to cool for another 30 minutes in the pan. You may need to run a knife around the edge of the cookies to help release them from the pan. Cool completely. Put the bowl and whisk in the freezer for 15 minutes until completely cold. Whip the heavy cream on medium high speed for several minutes until bubbly. Add the powdered sugar and beat on medium high until stiff peaks form. Take 1 cup of the whipped cream and fold into pudding until it is well combined. Do not mix vigorously as it will deflate the whipped cream. To assemble the cookies, put the mousse in a Ziploc bag. Cut the tip off the end of the bag and gently fill the middle of the cookie cup with mousse. Divide between cookie cups. Top mousse with a dollop of the leftover whipped cream. To finished them off, drizzle with caramel sauce, hot fudge and toasted coconut. It will help to heat the hot fudge in the microwave for 15 to 30 seconds until it will easily drip off your spoon. Cookies must be refrigerated in an air-tight container after the mousse has been added. 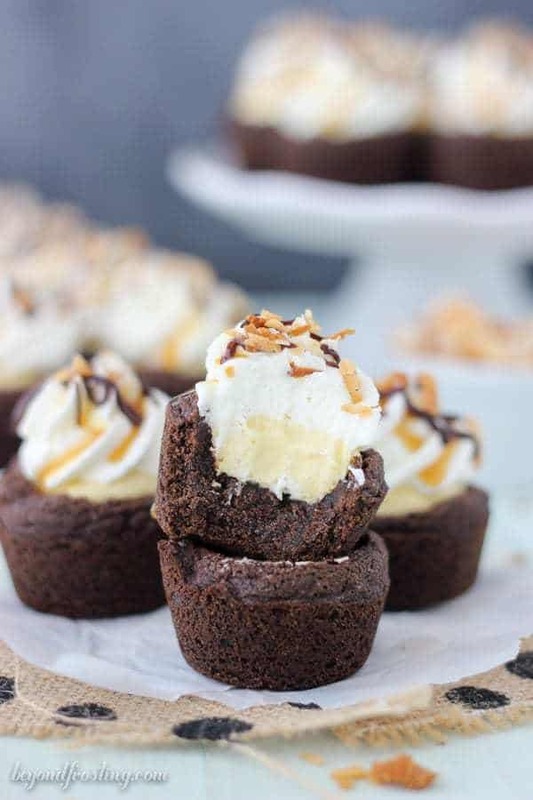 I’m in love with these cookie cups! Thanks lady! I can’t stop with the Samoa! Love cookie cups. 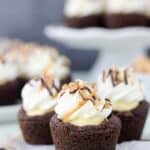 Hubby’s favorite; The Black Forest cups. If you turn your mini muffin pan upside down. Scoop up 1 heaping tablespoon of cookie dough and gently press the dough so that it completely covers the first muffin cup, creating an upside-down bowl shape. Awesome Colleen! The Black Forest ones are pretty fabulous! I have seen the upside trick for the cookie cups, so much fun! 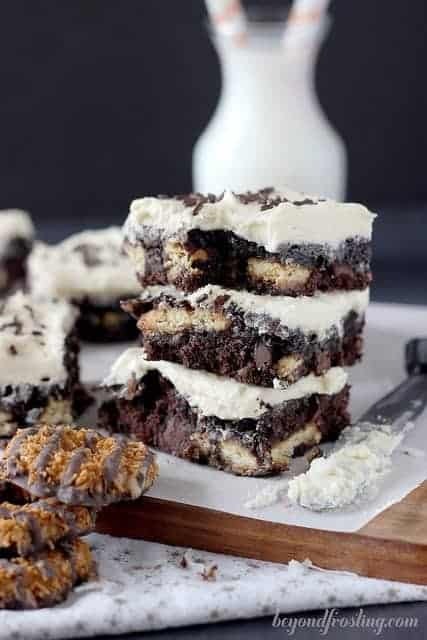 The instructions for the Samoa Cookie Cups indicate putting shortbread crumbs in the bottom of the muffin tins, but the shortbread crumbs are not mentioned in the ingredient list, and the picture does not show anything below the chocolate. Is this instruction just to make removal easier? Hi Joan, this is actually a typo. I have removed it. Thank you for calling my attention this this!